I know that this review is about nine days early but I couldn’t wait. You might think I’m biased because I run a Walden Media fan site, but you are free to think what you want. I am honest about my feelings about movies, regardless of who makes them, and I will be no different here. The film is about Will Burton, a boy that is troubled at school, but gets a fresh start at a new school where he makes some new friends and changes the lives of those he meets, as his life is changed for the better. He becomes the unwitting band manager for a high school band, as they prepare for the battle of the bands, called Bandslam. To start, I have to admit being worried about it. The trailer made it seem cheesy in a lot of ways, and I thought it might end up being a movie that I forget about later on. I jumped at the chance to get an early viewing, though, as I really didn’t know what to expect from it. One thing’s for sure, though: I had some low expectations from it. How did it fair? I loved it. I thought it was a wonderful film with great themes of friendship in times of hardship. I loved the lead character, thinking of him as a young Tom Hanks, as he carried the film very well as the average guy. From the trailer, I expected a very simple story, but it was multi-layered with complex relationships and learning opportunities. The acting was great all around. I liked all of the characters in it, equally, and think the film will grow stronger still with repeated viewings. The jokes in the film are even delivered differently from the trailer. The timing is better, and they land better on the big screen than they did there. The music is incredible, and reminded me only a little bit of School of Rock as far as the musicianship is concerned. The film’s cast displays great talent with both musical instruments as well as vocal talents. The awkward moments in the film are suitably awkward to the point that my friends recognized them as moments much like their own experiences. It made for great laughs when seeing them play out on screen, almost verbatim. It’s a refreshing film after a summer of explosions and epic grandeur. It is an excellent film, for both it’s target audience, as well as parents. I highly recommend it. 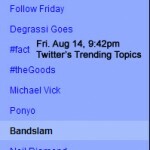 Bandslam will be in theatres on August 14. Why didn’t You see Bandslam?